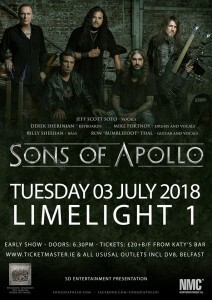 US supergroup SONS OF APOLLO, featuring members of DREAM THEATER, Mr. BIG, GUNS ‘N ROSES, THE WINERY DOGS and JOURNEY, will make a two date stop-over on Irish shores this coming July 3rd in the Limelight 1, Belfast on July 4th at the Tivoli Theatre in Dublin. Tickets on sale from www.ticketmaster.ie & outlets nationwide, www.tickets.ie & Sound Cellar. In early 2017, rumors began circulating about a new secret project including former DREAM THEATER members Mike Portnoy and Derek Sherinian. 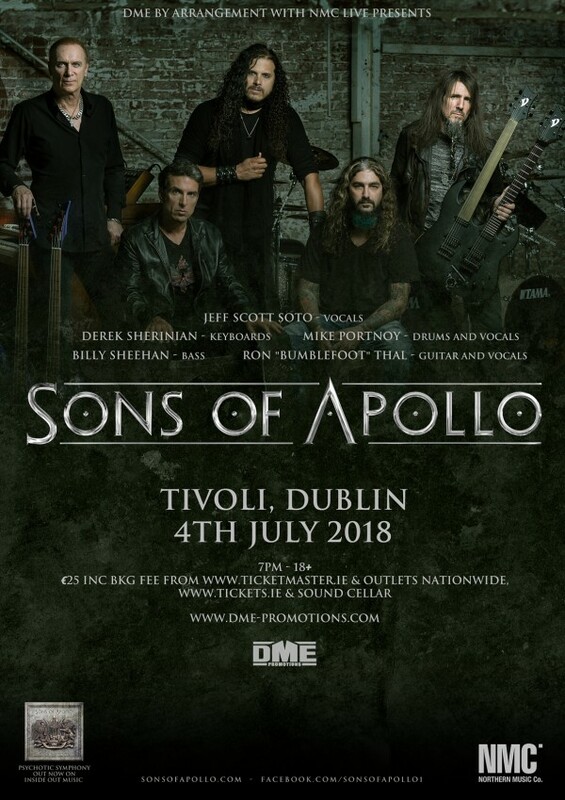 Finally, on August 1st, the duo revealed the details to the rest of the world, introducing their new band, SONS OF APOLLO. 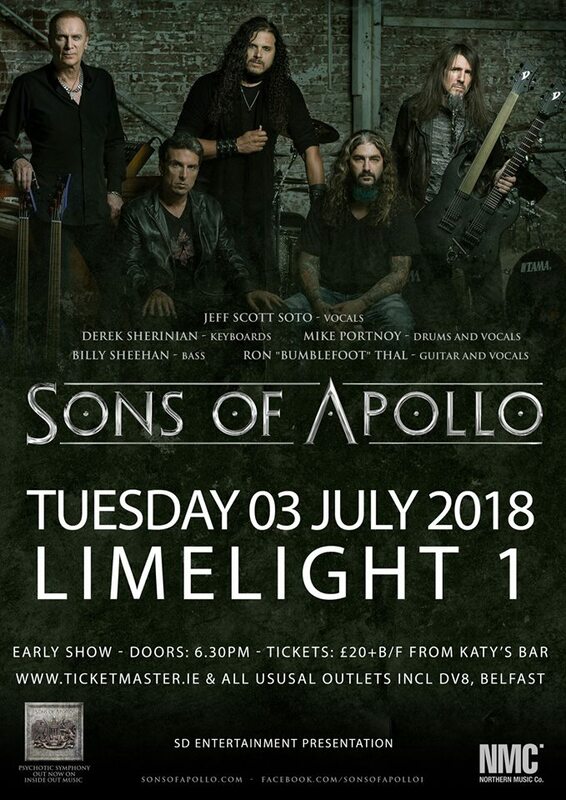 Reuniting to form SONS OF APOLLO, Portnoy and Sherinian join forces with guitarist Ron “Bumblefoot” Thal (ex-GUNS ‘N ROSES), bassist Billy Sheehan (THE WINERY DOGS, Mr. BIG, DAVID LEE ROTH) and vocalist Jeff Scott Soto (ex-JOURNEY, ex-YNGWIE MALMSTEEN’s RISING FORCE). Their debut album, “Psychotic Symphony”, was release on October 20th 2017 on InsideOutMusic/Sony Music. And was produced by the dynamic production duo of Portnoy and Sherinian, also affectionately known as “The Del Fuvio Brothers,” the nickname given to them over 20 years ago during their time together in Dream Theater. 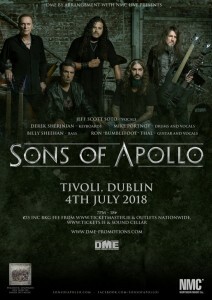 With Portnoy , Sherinian and Sheehan having previously toured together in the aforementioned lineup that came to be known as PSMS, playing instrumental versions of various songs drawn from each member’s history, SONS OF APOLLO was the next logical step. They kept that fire burning and stoked it higher by bringing in a different guitarist, adding a vocalist, and creating all original material. The nine songs comprising Psychotic Symphony incorporate the progressive style and individual technical prowess Portnoy and Sherinian shared together in Dream Theater, combined with the swagger and groove of Van Halen, Deep Purple and Led Zeppelin.